Citing a more modest outlook for the economy, the Federal Reserve on Wednesday held interest rates steady and signaled it doesn't plan to raise rates at all this year and bump them up just once in 2020, providing a roadmap for a sustained period of easy-money policy. "The U.S. economy is in a good place," Fed Chairman Jerome Powell said at a news conference, adding policymakers foresee "a modest slowdown, with overall conditions remaining favorable. We see no need to rush to judgement (by lifting or cutting rates)." The move comes after the central bank repeatedly has telegraphed its plan to scale back rate hikes in 2019 in the face of a U.S. and global economic slowdown and markets that have shown no tolerance for higher borrowing costs in that environment. But a two-day meeting that concluded Wednesday provided the Fed its first opportunity to trim its fairly upbeat December forecasts for the economy and rates. The Fed also announced that it will end a campaign to shrink its $3.8 trillion balance sheet later this year, a move that should help keep a lid on long-term rates. As expected, the Fed kept its key short-term rate at a range of 2.25 percent to 2.5 percent. After holding rates near zero for years after the Great Recession ended in 2009, the central bank has lifted rates nine times since late 2015, including four times last year, as the economy has strengthened. The increases have bumped up rates on credit cards, certain mortgages and auto loans while providing higher rates on banks savings accounts after years of paltry returns. But those rates are now expected to remain fairly stable through next year, if the economy cools off as Fed policymakers expect. In December, after the Fed downgraded its forecast from three hikes to two in 2019, markets sold off on the belief that blueprint was still too aggressive amid slowing growth in Europe and China, the U.S. trade war with China, and the fading effects of federal tax cuts and spending increases. 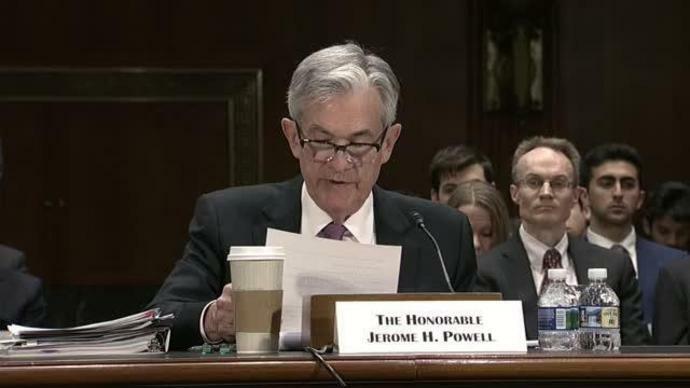 With plunging stocks hammering consumer and business confidence and inflation subdued, Fed Chairman Jerome Powell and other policymakers made an abrupt turnabout, saying the Fed will be "patient" as it weighs future hikes. The broad stock market in turn, has rallied, though it remains below its late September peak. The Fed cut its forecast from two hikes this year to none. It expects one hike in 2020. Policymakers estimate the benchmark rate will remain at 2.4 percent at the end of 2019 and rise to 2.6 percent in 2020, down from 2.9 percent and 3.1 percent, respectively, in their December estimate. Before Wednesday's release, Fed fund futures markets were predicting no hikes this year, according to CME. Since October 2017, the Fed gradually had been shedding the $3.5 trillion in Treasury bonds and mortgage-backed securities it purchased after the financial crisis to lower long-term rates and spur growth. As a result, the Fed's total asset portfolio has fallen to $3.9 trillion from a peak of $4.5 trillion. Rather than sell the bonds, the Fed largely has stopped reinvesting their proceeds as they mature. As much as $50 billion a month in assets have rolled off its balance sheet, draining that amount of cash from the banking system and putting some upward pressure on long-term rates. The Fed said Wednesday that in May it will put a stop to that initiative. It will reduce the amount of Treasuries that comes off its books from up to $30 billion a month to up to $20 billion and halt the roll-off of the assets in September. And it will reinvest up to $20 billion in monthly mortgage bonds in Treasuries starting in October. The moves should lower the Fed's balance sheet from about $3.9 trillion to about $3.5 trillion, well above the $3 trillion dollars previously anticipated. But the mix of assets will skew more toward Treasuries, reducing its supply of mortgage bonds and providing less support for lower mortgage rates. Policymakers have said that leaving extra cash in the financial system will better allow the Fed to control interest rates and banks to meet requirements for higher capital buffers in the wake of the financial crisis. Yet the bigger portfolio also should translate into slightly lower long-term rates during a period of economic uncertainty. The Fed said "economic activity has slowed from its solid rate in the fourth quarter." Many economists expect growth of just 1 percent to 2 percent in the first quarter, largely because of the partial government shutdown. The central bank estimates the economy will grow 2.1 percent in 2019, down from its prior 2.3 percent forecast, and 1.9 percent in 2020, below its previous 2 percent projection. Juiced by the federal stimulus, the economy expanded by 3.1 percent last year, its best showing since 2005. While a second-quarter rebound is expected, the economy is likely to slow later this year as the effects of the $1.5 trillion tax cut and $300 billion in two-year spending increases peter out. Lately, the economy has been mixed. Retail sales fell sharply in December and only partly rebounded in January. Manufacturing has softened amid the overseas troubles but the service sector has strengthened. While job gains were meager in February, the Fed said they "have been solid, on average, in recent months, and the unemployment rate has remain low." With the economy slowing, the central bank raised its estimate of the unemployment rate at the end of this year to 3.7 percent from 3.5 percent. It expects the jobless rate to take up to 3.8% percent by the end of 2020, above its December forecast of 3.6 percent. Employers added a robust average of 223,000 jobs a month last year, but many analysts expect average gains to fall to about 160,000 this year as the economy downshifts and the low unemployment rate makes it harder to find workers. Workers shortages helped boost average annual wage growth to a nine-year high of 3.4 percent in February. Just 20,000 jobs were added last month - a poor showing that largely has been chalked up to weather effects but may also reflect a slowdown in hiring. The Fed expects its preferred measure of annual inflation to rise from 1.7 percent to 1.8 percent by year-end and 2 percent for 2020, below its December forecast of 1.9 percent and 2.1 percent, respectively. And it kept its estimate of a core reading that strips out volatile food and energy items at 2 percent over the next three years - right at the Fed's target -- up marginally from the most recent reading of 1.9 percent. Inflation has been surprisingly tame in light of the faster pay increases that businesses were expected to pass to consumers through retail prices. Many economists expect inflation to continue to be tempered by cheap oil and long-term factors such as discounted online shopping. The Fed revised down its estimates for the economy and rates this year to align with its recent views of a slowing global economy and volatile financial markets. It's also taking a market friendly step of leaving its balance sheet at a higher level. At the same time, policymakers are aiming for a delicate balance by sending the message that the economy and labor market remained on solid footing. "I&apos;m not even a big believer in democracy. I always say that democracy can be two wolves and a sheep deciding what to have for dinner," Moore said. Four Republican U.S. senators voiced opposition to Trump's expected nomination of Cain in recent weeks, likely enough to deny Cain the support he needed to secure Senate confirmation for the post. Economists and critics have expressed concerns about loyalists of Trump serving on the traditionally nonpartisan central bank. Cain has been a public advocate of many of Trump's policies, as has Stephen Moore, a fellow at the conservative Heritage Foundation think tank, who Trump has also said he wants to nominate for one of two vacant seats on the seven-member Fed Board of Governors in Washington. WASHINGTON (AP) - President Donald Trump said Monday that Herman Cain has withdrawn from consideration for a seat on the Federal Reserve's board amid a focus on past scandals and doubts about his qualifications for the role. President Trump says the former GOP presidential candidate asked that his name be withdrawn from consideration for a seat on the Federal Reserve. Herman Cain, the former pizza chain executive picked by Donald Trump for an empty seat on the US Federal Reserve, has withdrawn his candidacy, the president said Monday. Cain's chances were scuppered after four Senate Republicans went public with their opposition to him getting onto the board of the central bank. Cain was also opposed by Democrats, meaning his nomination would fail to win confirmation in the upper house.